Nelco Vet introduces allerpaws! 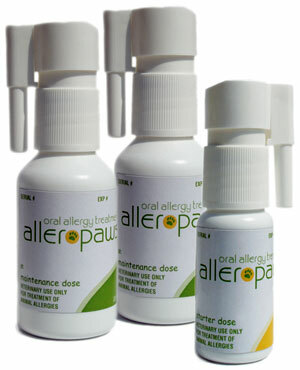 An oral allergy treatment determined to be as effective as shots – without the pain, without the stress, and in an easy to administer spray. Owners often are resistant to administering allergy shots. allerpaws’ unique delivery system – a quick, metered, swivel spray into the side of mouth or under the pet’s tongue – eliminates the owner’s biggest obstacle to effective allergy treatment. Your clients will be reassured to learn SLIT (sublingual immunotherapy) has been used effectively in Europe for more than 20 years to treat humans. We’ve made it easy for you to prescribe and educate your clients and staff about this new approach to allergy treatment. We can formulate a customized prescription based on any faxed test results or regionally formulated based on your evaluation of the animal’s symptoms and history. Your order will include the easy-to-understand dosage sheet and clear reorder instructions. This spray treatment is painless, easy to administer, and not time consuming to your clients. *An independent, two-year study funded by Nelco Vet and conducted by a leading veterinary medical university showed clinical improvement consistent with traditional subcutaneous immunotherapy (allergy shots). Call 888.708.PAWS (7297) today for pricing or to order.